Pumpkin puree is a snap to make with a slow cooker. Just cook, mix, and store in the refrigerator or freezer. * Use this method for pumpkins and other winter squash varieties. Remove the stem and cut the pumpkins into halves, thirds, quarters, or smaller chunks. Scoop out the seeds and fibers. Discard the seeds or rinse them set aside to use in Basic Toasted Pumpkin Seeds or Sugar and Spice Roasted Pumpkin Seeds. Arrange the pumpkin pieces in your slow cooker. I used a 6-quart slow cooker for 3 pumpkins. Cover and cook on LOW for about 5 hours, or until the pumpkin pulp is quite soft. This might vary from one slow cooker to the next. Let the pumpkin cool in the slow cooker. When the pumpkin is cool enough to handle, scoop the pulp out into a large bowl and discard the shells. With a mixer on high speed, beat the pumpkin until the pulp is smooth. Or, use a food processor or blender to puree the pumpkin in batches. Spoon the pureed pumpkin into freezer containers, zip-close freezer bags,** or wide-mouth 1-pint canning jars, leaving about 1/2-inch headspace. If you're using narrow-mouth canning jars, leaving about an inch to allow for expansion. Glass can break if there isn't enough headspace. Label the containers with the name and date and refrigerate for 5 to 7 days or freeze for up to 3 months. 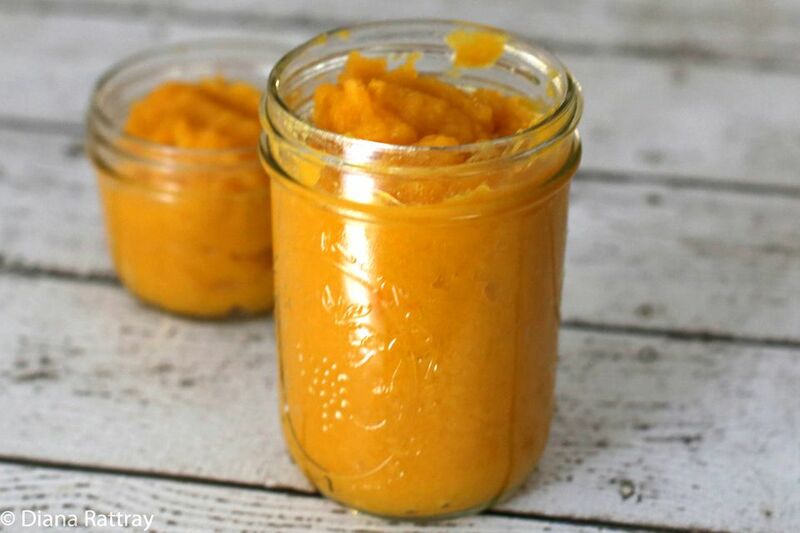 Use the homemade puree in recipes just like you would use canned (unseasoned) pumpkin puree. You should get about 3 to 4 pints from a large (6 to 7-quart) slow cooker with 3 to 4 pumpkins. Defrost in the refrigerator overnight or in the microwave. *The USDA does not recommend home canning for pumpkin butter or pumpkin puree. From the National Center for Home Food Preservation: "Freezing is the easiest way to preserve pumpkin, and it yields the best quality product." **Pack the pumpkin in the freezer bags and flatten them out as much as possible to remove air and for quick freezing. Label and date before storing in the freezer.